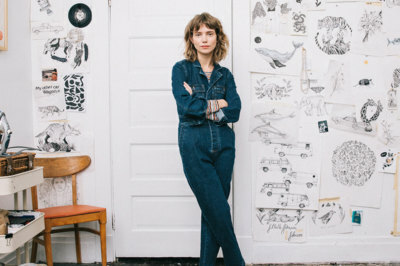 For the past several months, seven makers have been hard at work as they prepare for their big debut on madewell.com. Now the moment has finally come to shop their one-of-a-kind handcrafted objects (think hand quilted pillows in geometric motifs; frame-worthy hand drawn prints; and maple and walnut serving boards carved entirely by hand) on Madewell’s online marketplace. Meet the inaugural class of Nest and Madewell Hometown Heroes Collective participants: Alex Clarke of Alex Clarke Woodworking (Madison, WI); Samuel and Juan Solorzano of Brother’s Design Co. (Madison, TN); Emily Miller of Elizabeth Miller (Nashville, TN); Anna Zeitlin of Fanny & June (Nashville, TN), Henni Dubois (Jersey City, NJ); and Arianna Caggiano of Quiltkween (Savannah, GA). These exceptional artisans were selected based on their ability to demonstrate high quality craftsmanship while exemplifying innovation and individuality through their work. By purchasing from the Hometown Heroes Collective, you will not only take home beautiful handcrafted items, but you will also support Madewell and Nest’s mission to give US-based makers a platform to grow their small businesses. All makers participating in the Collective received business coaching and special perks leading up to launch like having their products professionally photographed by Madewell. All makers have also been granted access to Nest’s Guild, a global community that delivers pro bono business education and resources to artisan entrepreneurs. To fete the first collective, Madewell and Nest are opening up our headquarters today to host the Hometown Heroes for a day of roundtable discussions, immersive learning opportunities, and tours of our own homes here in New York. This evening, we will gather in the company of Nest supporters and Madewell customers, for a panel discussion hosted at the Madewell flagship store. The conversation, moderated by Nest’s founder and executive director, Rebecca van Bergen, will bring to light fresh insights straight from makers themselves on what it means to be a an artisan; the connections between craftsmanship and cultural heritage; and the importance of design innovation in the context of today’s ever-changing world. Please join us to celebrate these outstanding Hometown Heroes by visiting the madewell.com marketplace!